Prospects Education Resources. WHICH A LEVELS? Making the right choice of A levels is crucial. Not only will it affect your enjoyment of studying over the next two years but it also has implications for your choice of career or higher education options. 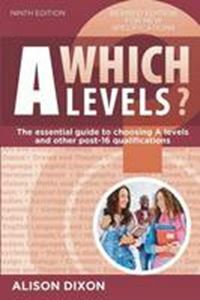 The ninth edition of this, student-friendly guide has been revised and updated to include details of the new A level specifications. It also contains information on apprenticeships, an increasingly popular alternative to full-time higher education as well as other routes into education and training. Each subject entry covers: What and how you study; which A levels fit well together for competitive courses and careers; related higher education courses; career and training options after A levels and degree courses and alternative qualifications such as the International Baccalaureate.